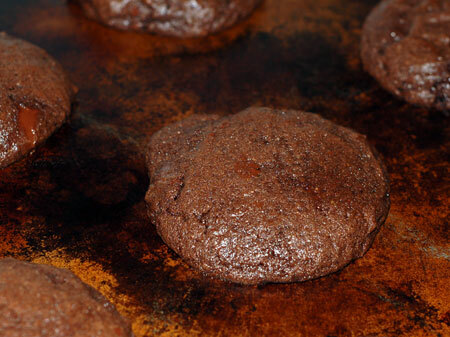 I’ve been making these brownie cookies periodically for the past three years, and they don’t look like much, but they’re always delicious. They stay nice and chewy for several days after baking, and are eye-rollingly delicious if you zap them in the microwave for a few seconds. I found the recipe online somewhere, but realized after having made a batch or two that the recipe was identical to the one on the back of a box of Crisco sticks. Go figure. This year I tweaked it a little in a bare nod to healthy eating habits, and find the fact that I used organic Spectrum shortening instead of Crisco more amusing than perhaps the situation warrants. My other tweaks included the use of Wondercocoa (which is fat-free and virtually caffeine-free), and (surprise!) the inclusion of some white whole wheat flour. I then dumped in a bag of Ghirardelli 60% bittersweet chocolate chips, which probably negated my meager attempts at bringing down the caffeine, but I prefer to concentrate on their antioxidant properties. In any case, they tasted just the same as always, and Jeremy declared them his favorites out of this year’s cookie crop. The only important thing to know about these cookies is that when they come out of the oven, they will be (and should be) still very soft and gooey. DO NOT try to move them off the cookie sheet for several minutes. The original recipe says 2 minutes, but I use a baking stone, and a few extra minutes of rest works better for me. If you try to move them or eat them too soon, all you will get is burned fingers and a molten chocolate cookie mess. (There are worse things that could happen in a kitchen, I know.) Give them a chance to cool on the sheet, then on the foil, and everyone will be happier. Or dig in sooner at your own risk. Combine shortening, brown sugar, water and vanilla in bowl of stand mixer. Beat with paddle at medium speed until well blended. Beat eggs into creamed mixture. Combine flour, cocoa, baking soda, and salt. Mix into creamed mixture at low speed just until blended. Stir in chocolate chips. Drop by rounded tablespoons 2 inches apart onto a baking stone or ungreased baking sheet. Bake at 375F for 7-9 minutes, or until cookies are just set. Do not overbake! Cookies will appear soft and moist, and will need to cool for at least 2 minutes on the baking sheet before being transferred to the foil to cool completely. They do puff up a bit during cooking, and benefit from a flattening tap to their tops when they come out of the oven, as discussed here.